The Massachusetts Department of Transportation and Massachusetts Bay Transportation Authority launched a one-year joint pilot program on April 1 that provides ride-hailing companies with a subsidy on a per-hour basis for every hour they make wheelchair-accessible vehicles or WAVs available for paratransit riders. This program expands on a program launched in October 2016 with Uber and Lyft that offers on-demand ride-hailing services to users of MBTA’s door-to-door paratransit service, known as the RIDE program. 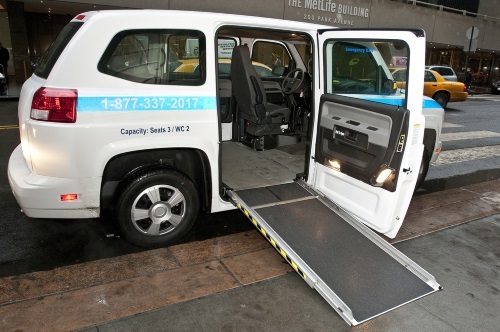 MassDOT and MBTA said in a statement that this new WAV initiative came about in response to user feedback that wheelchair-accessible vehicles are not widely owned by ride-hailing company share drivers due to high costs. The new one-year WAV subsidy pilot provides a fixed per-hour subsidy for each hour that an Uber or Lyft WAV is available on their respective ride-hailing mobile applications, the agencies said. The per-trip fee assessed through the 2016 Act Regulating Transportation Network Companies will be used to reimburse participating ride-hailing drivers in exchange for providing on-demand WAVs within the RIDE service area. MassDOT and MBTA estimate that this subsidy will cover approximately 50 percent of actual WAV supply cost with ride-hailing companies contributing the remainder. Ride-hailing firms participating in this pilot program will be reimbursed on a weekly basis by the MBTA according to the number of “WAV Supply Hours,” which is a measure of the availability of wheelchair-accessible vehicles for use by customers. The expected annual cost of this one-year pilot is approximately $2.4 million, MassDOT and MBTA said, with the goal to quadruple the WAV supply hours. While the pilot will launch within the RIDE service area, MassDOT and the MBTA said they plan to explore similar pilot options for regions outside the service area if this pilot is deemed successful.